James Hillhouse commanded the Governor's Foot Guard in New Haven during the American Revolution, became active in early American politics, and served as Yale's treasurer for fifty years. Hillhouse created the Grove Street cemetery, lined New Haven's streets with the elm trees for which it would become famous, and helped bring about the Farmington-New Haven canal. One of Hillhouse's most important, but least-remembered roles, however, was that of the antislavery leader of the U. S. Congress in the early days of the republic ... As early as 1799, Senator Hillhouse served on a committee to investigate the ending of the slave trade, which he helped to pass at the earliest constitutionally-authorized moment. 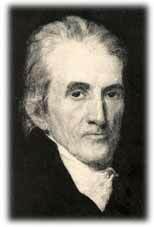 After the Louisiana Purchase of 1803, Hillhouse fought to bar the importation of slaves into the Louisiana Territory. "I consider slavery as a serious evil," he proclaimed, "and wish to check it wherever I have authority." Two of Hillhouse's amendments restricting slavery actually passed the Congress and were signed into law. Although the stiffest restrictions did not pass, the historian Don Fehrenbacher asserts that "the magnitude of [Hillhouse's] effort ought to be recognized." His amendments constituted, "the strongest antislavery restriction imposed on any portion of the Deep South between 1735 and 1865." Proslavery forces soon overwhelmed Hillhouse's restrictions, however, and the Louisiana Territory became the heartland of the cotton explosion, embedding slavery inextricably into the fabric of the nation. During the Missouri controversy of 1819-21, he circulated an attack on the institution that was so blistering that his colleagues in Washington warned that it might incite Southern representatives to disunion. James Hillhouse understood that the ideals of democracy were incompatible with the existence of slavery. Unlike John C. Calhoun or Samuel F. B. Morse, Hillhouse proclaimed that the ideals of democracy were more important. There is no Yale building named after James Hillhouse. The City of New Haven remembers him with "Hillhouse Avenue," the street connecting Yale's central and science campuses, and with "Hillhouse High School." This high school used to stand between Broadway and the Tower Parkway, but in the 1950s Yale purchased this land from the city and razed the buildings to make space for two more residential colleges-Stiles College and Morse College-and the high school moved further out from town. From September 13-15, 2001, The Amistad Committee has scheduled, jointly with Yale's Gilder Lehrman Center, a ceremony to honor Hillhouse's anti-slavery advocacy. September is official Connecticut Freedom Trail Month. Since there is no "Hillhouse" building on Yale's campus, the Saturday ceremony will be held at his gravesite in the Grove Street Cemetery, and in the Hall of Graduate Studies. Numbers in parentheses refer to notes. See the notes page.